Synonym: Diospyros discolor, Diospyros philippensis. 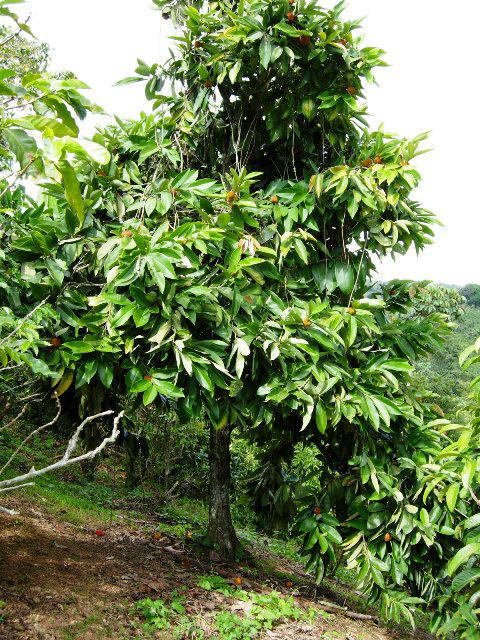 Mabolo is indigenous to the Philippines. It is a plant of very common occurrence there and is widely distributed in primary and secondary forests at low and medium altitudes. Besides Philippines, it is also distributed in Taiwan. It is cultivated in Peninsular Malaysia, Sumatra and Java, and other tropical countries. It is usually cultivated as a backyard plant. It has been introduced into other tropical countries. 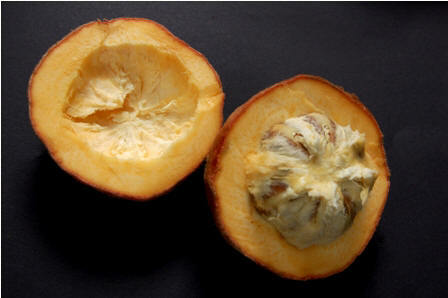 Mabolo is a very beautiful dark red to purple colored fruit with velvet-like skin. In fact the word, “mabolo” in the Philippine language means “hairy”. So the name “Mabolo” has been assigned to it because of its hairy surface. 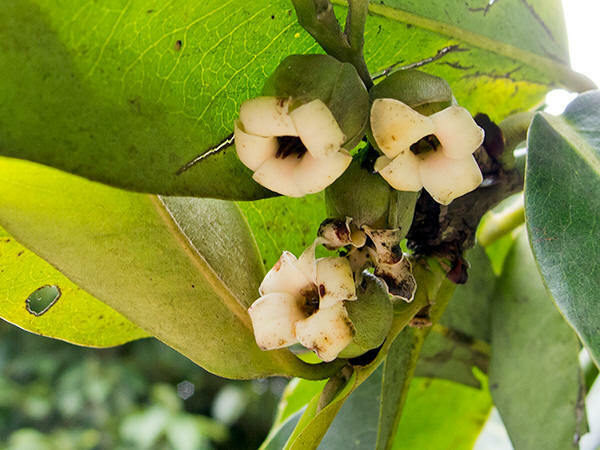 Mabolo is higly esteemed locally but is virtually unknown in other parts of the world. Leaves alternate, oblong, 8-30 cm x 2.5-12 cm, entire, base usually rounded, apex pointed, coriaceous; upper surface dark-green, shiny, glabrous, lower surface silvery hairy; young leaves pale-green to pinkish, silky-hairy; petiole up to 1.7 cm long. Male flowers in 3-7 flowered axillary cymes; pedicel short; calyx tubular but deeply 4 lobed, about 1 cm long; corolla slightly larger than calyx, tubular, 4-lobed, creamy-white; stamens 24-30, united in pairs at base; female flowers solitary, axillary, subsessile, slightly larger than male flowers, with 4-5(8-10) staminodes. Fruit a globose or depressed-globose berry, 5-12 cm x 8-10 cm, velvety, brown-reddish, capped at base with the persistent stiff calyx; skin thin, densely coated with short golden-brown hairs, emanating a strong, cheese-like odour; flesh whitish, firm, rather dry, sweet, astringent, aromatic. Fruits are usually eaten fresh out of hand. These are also used in salads and desserts. These taste rather sweet but are quite dry. The flesh can also be diced and combined with that of other fruits in salads. The fruit has 60-73% edible portion which contains, per 100 g: water 83.0-84.3 g, protein 2.8 g, fat 0.2 g, carbohydrates 11.8 g, fibre 1.8 g, ash 0.4-0.6 g, calcium 46 mg, phosphorus 18 mg, iron 0.6 mg, vitamin A 35 IU, thiamine 0.02 mg, riboflavin and niacin 0.03 mg, vitamin C 18 mg. The energy value averages 332 kJ/100 g.
The tree is often planted for its rather sweet but dry edible fruits, and also as a roadside tree. 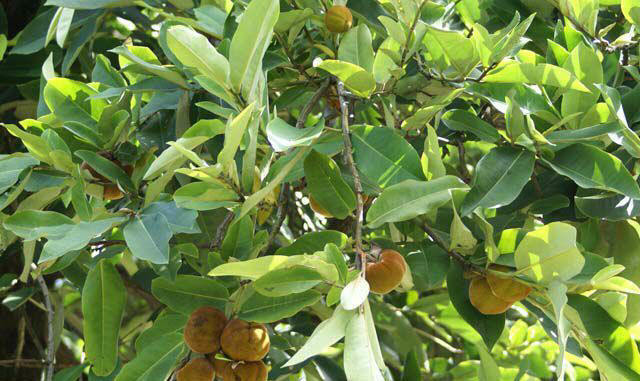 Mabolo is a very productive fruit tree. 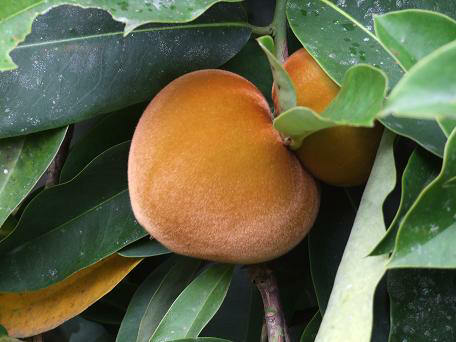 The fruit, however, lacks sweetness and is rather dry, making it less popular than many other tropical fruits. There is a need to select superior clones.